This easy Ploughman’s Salad is a healthy spin on a traditional British Ploughman’s Lunch! 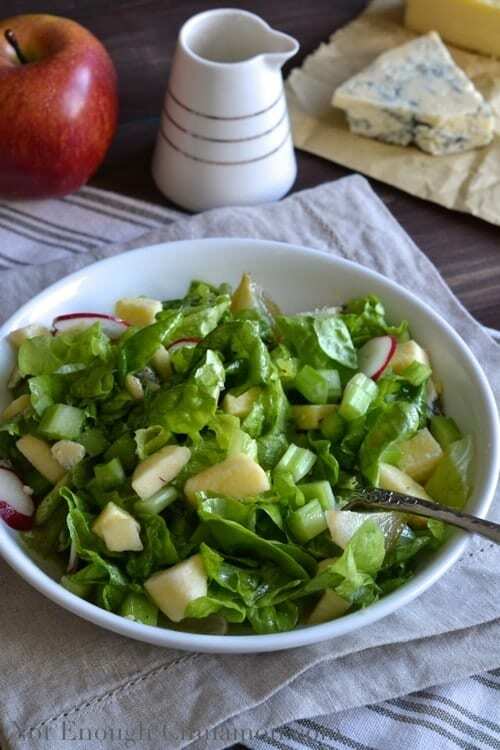 Packed with crunchy apples and celery, and topped with sharp cheddar and creamy stilton, this lunch salad is full of vibrant flavors! The first time I heard about Ploughman’s lunch I was really intrigued. I’m not sure about you, but ‘ploughman’ sounds odd to my French ears. And to be honest, I had no idea what this word meant. Even after two years in Australia, online dictionaries are still very useful to me sometimes! If you’re American and don’t understand either, don’t freak out, it’s normal. It’s a British English word meaning plowman. Ok, translation issue solved! Moving on to…what the heck is a ploughman’s lunch? My best friend Google taught me that it’s a traditional British cold meal, very popular in pubs, consisting of crusty bread, cheese and pickled onions. These are the key ingredients but you’ll find lots of variations including apple, celery, chutney, ham and so on. I guess every chef has its own definition of a ploughman’s lunch. I came across this recipe for Ploughman’s Salad in Gordon Ramsay’s cookbook Ultimate Home Cooking and loved the sound of it. He tweaked the traditional meal and turned it into a ploughman’s salad with loads of lettuce, crunchy apples, radishes and celery. In his recipe, he uses two types of cheese, Cheddar and Stilton, an English blue cheese. If you can’t find any Stilton where you live, you can use your favorite blue cheese instead. The result is an original, multi-faceted salad: every bite you take is a mix of savory, sweet, sour and sharp flavors. If you’re bored of your usual go-to lunch salad, give this Ploughman’s Salad a try, you won’t regret it! 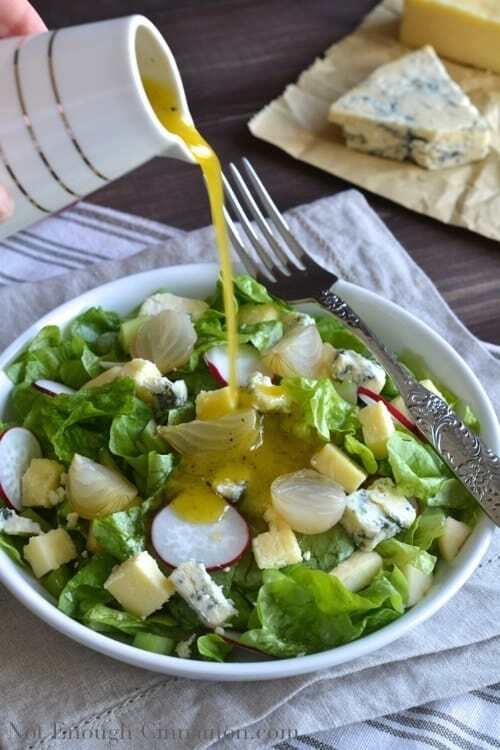 If you tried this Ploughman’s Salad, don’t forget to rate the recipe below and let me know how it went in the comments – I love hearing from you! You can also follow me on Instagram, Pinterest and Facebook for more deliciousness and behind-the-scenes! This easy Ploughman's Salad is a healthy spin on a traditional British Ploughman's Lunch! 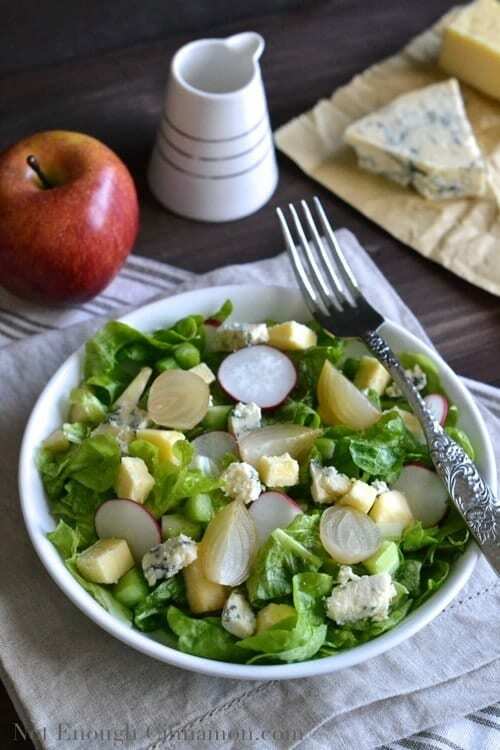 Packed with crunchy apples and celery, and topped with sharp cheddar and creamy stilton, this lunch salad is full of vibrant flavors! Add mustard, honey, vinegar, olive oil, salt and pepper in a medium bowl, and whisk to combine. 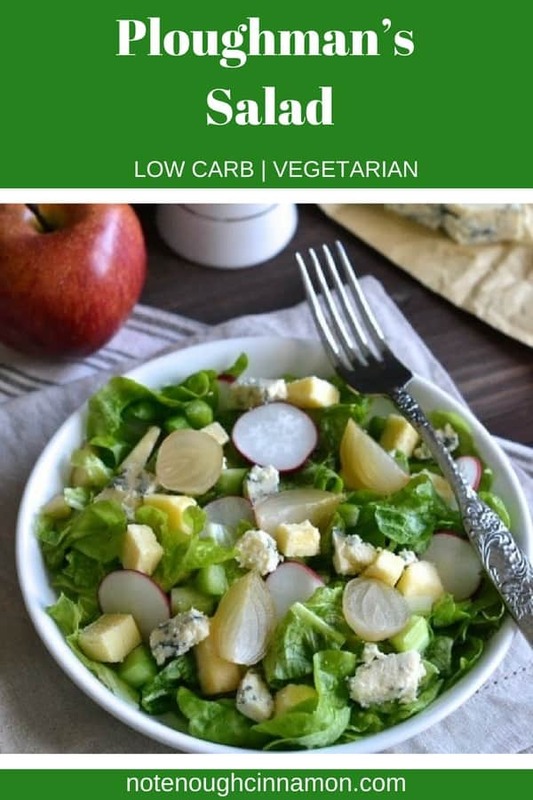 Add lettuce, apple, celery and radish slices in a large bowl and mix together. Pour dressing on top and toss to coat the salad. Serve between four plates and top with cheese and pickled onions. Toss lightly and serve with crusty bread. Another traditional ingredient of the Ploughman's salad is thick cuts of ham. Feel free to add some! This is my kind of Ploughman’s Lunch! I would take a salad over a cheese platter any day!